The genus name, Verbascum, derives from the Latin barbascum, "with beard." The species name, thapsus, is that of an ancient town in what is now Tunisia. The common name mullein derives from the Middle English moleyne, "soft." There are some three hundred species of mullein native to Eurasia and North Africa; several are now naturalized in North America. This biennial plant can reach 7 feet in height. In its first year, it forms a basal rosette of large, pointed leaves with woolly hairs. The second year, a long, unbranched stalk usually forms and produces a spike of yellow hermaphroditic flowers and alternate, elliptical stem leaves. The hairiness of mullein enables it to survive in hot, dry conditions, and it is often found in waste areas and ditches. In the garden, mullein thrives in full sun and welldrained soil, with low to moderate amounts of water. Leaf: alterative, anodyne, antibacterial, antihistimine, anti-inflammatory, antiseptic, antispasmodic, antiviral, astringent, demulcent, diuretic, emollient, expectorant, pectoral, vulnerary, yin tonic. Flower: analgesic, anti-inflammatory, antispasmodic, demulcent, emollient, mucilaginous, nervine, sedative. Root: diuretic. Mullein leaf and flower nourish yin, stimulate and cleanse the lungs and lymphs, liquefy phlegm, relax the bronchioles, resolve swelling, relax spasms, and deter infection. They are often recommended for intense coughs that wear down the villi of the lungs. The flower is more demulcent than the leaf, and the leaf more astringent than the flower. The leaf is used in the treatment of asthma, bronchitis, catarrh, colds, congestion, coughs, cystitis, diarrhea, dysentery, dyspenea, eczema, emphysema, flu, hay fever, kidney infection, laryngitis, lung weakness, mumps, pharyngitis, pleurisy, rheumatism, scrofula, shortness of breath, swollen glands, tonsillitis, tuberculosis, tumors, and whooping cough. The flower is used in the treatment of flu, laryngitis, and pharyngitis. A drop or two of the flower-infused oil, slightly warmed, can be administered to the ears to relieve the pain of and combat ear infection. The root is used in the treatment of incontinence. 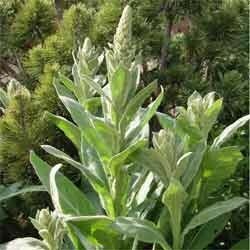 Topically, the mucilaginous mullein leaf is used as a healing compress in cases of acne, boils, bruises, earache, eczema, glandular inflammation, hemorrhoids, mastitis, mumps, rheumatic joints, and tumors. It also can be used as a bath herb to ease rheumatic joints or smoked to treat asthma. The root can be applied topically to relieve toothache; the juice of the root can be applied topically to remove warts. Mullein is not generally considered edible, aside from as tea. As tea, mullein leaf has a mild, pleasant, sweet, though slightly bitter flavor. Be sure to strain the tea through a very fine strainer to remove the irritating hairs found on the leaves. The leaves of mullein can be fed to animals to treat cough. The tall stalks were once dipped in tallow and lit as torches, while the leaves can be rolled and tied with thread and used as wicks in oil lamps. The soft mullein leaves have long been used by children as doll blankets. A yellow dye is made from the flower. In folkloric tradition mullein is carried to inspire courage, to prevent wild animals from attacking, and to attract love. Mullein is generally regarded as safe, though the leaf contains coumarin and rotenone, which in the past have drawn expressions of concern from the U.S. Food and Drug Administration. The seeds of the plant should not be consumed, as they are somewhat toxic.